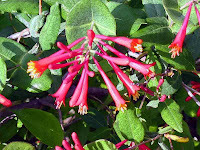 Honeysuckle (Lonicera) has always been impossible for me to find in my area. I've searched around for it, but I could never find any source. While on vacation at Fenwick Island, Delaware, we managed to pick up a few vegetables and fruits from a local produce market. Next to the market was a tree filled with honeysuckle blossoms! I immediately picked one blossom (not thinking whether the crabs would like it or not) and brought it to the hotel to dry. 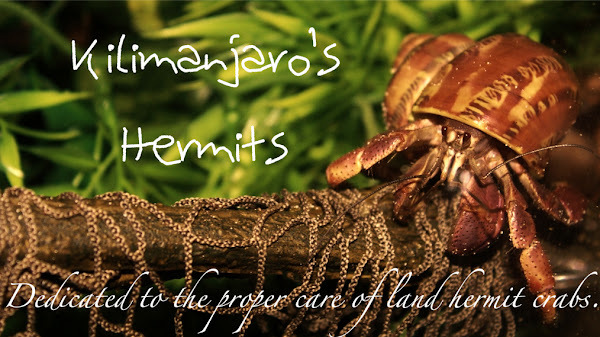 At the time, my crabs were at home, so I figure I'd bring it back to them a little dry. Needless to say, I bought four more crabs at Fenwick Island and brought them home into the 20L crabitat. I placed the honeysuckle blossom inside of the crabitat and they have all been taking turns munching on it, especially the Fenwick Island micros. 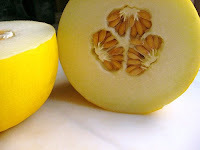 While at the produce market I mentioned above, my family picked up a melon we have never seen before called a "canary melon" because of its bright, yellow rind. I've never tried one of these, but I think I am going to experiment with the crabs. I'm still checking with EH and the HCA to see if anyone knows if it is safe or not. I think it will become a food trial soon, so keep an eye out for that upcoming post!